Marin County Fire Chief Jason Weber said the Irving Fire was started by a downed PG&E power line. "The investigators determined the cause to be a power line that came down into the grass," Weber told KQED. Meanwhile, a bill that would provide utilities liability protection has been signed by Gov. Jerry Brown. 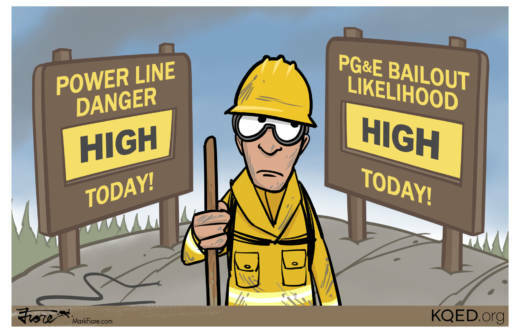 Senate Bill 901 allows utilities like PG&E that caused massive wildfires across Northern and Central California to issue bonds to pay for huge liability costs. With PG&E facing hundreds of lawsuits from last year's fires that may cost the company around $17 billion, SB 901 also allows utilities to pass along the cost of future fires to their customers.